I have been wanting to make a mosaic for awhile now. I always envisioned myself purchasing old plates from a second hand store, smashing them to bits, and then creating something beautiful out of them. Last weekend on a team building excursion to Little Shop of Crafts in the Upper West Side, I passed up painting and pottery for a chance to mosaic. The process was a lot safer than my fantasy of breaking dishes and relatively easy. Little Shop of Crafts is geared towards children and parties (birthdays and bridal showers) but can be fun for all ages. While I was there I saw a few couples on dates and many adults intently working on their art pieces. I chose to make a trivet. My design inspiration was a peacock feather. I painted the base in three layers to give it some dimension. The colors I chose were blue, silver, and green. After I was done painting, the color was sealed to give the wood a glossy sheen. I had a variety of tile colors to choose from. The tiles provided were 1/2 inch squares. I used tile cutter pliers to modify the shapes of the tiles. It was important to hold the pliers firmly and shield the tile while cutting so that the tile would not fly away. Now the design. I wanted to make a peacock feather but could not envision what a peacock feather looked like from memory. I had no print out or example from a book to look at. I tried a few different ways to come up with a configuration to represent a peacock feather but couldn't get it quite right. Abandoning the idea, I went with a circular design consisting of purple, mirror, green, and blue tiles. I also threw in a few plastic jewels to break up the pattern. I used Elmer's Glue to secure the tiles and jewels in place. I also put painter's tape around the edges of the trivet to protect the paint job from the grout. That was it for day one. The glue had to dry for 24 hours. I found the design and glueing to be the hardest part of making a mosaic. It was tedious and required a lot of patience. The smaller the tiles, the longer it took to glue. Also, there were a few times when the corners of the tiles cut me. For my trivet, I used about a cup of grout. I added water and mixed the grout powder until it became a paste. I then slathered it over the tiles and completely covered the surface, filling in all the spaces in between the tiles. After 15 minutes, I used a damp sponged to wipe off the excess grout. I then waited three hours for the grout to dry. Time to peel off the painter's tape! I cleaned off the tiles with all purpose cleaner. Something like Windex works just as well. This is the finished project. I am happy to say my mosaic is a success! Gooby Goo & Peekers played their first East Coast show ever at Littlefield in Gowanus, an area in Brooklyn situated along the Gowanus Canal. The neighborhood is industrial and desolate. It was a peculiar choice of venue but fitting for their caliber. Gooby Goo & Peekers came all the way from Studio City in Southern California. Brooklyn was a pit stop before making their way on to Canada. Peekers graced the stage in a blue dress reminiscent of Alice of Alice in Wonderland. All that was missing was the white apron and white tights. Gooby Goo played backup for her as she bobbed around on stage. The two went back and forth in banter explaining how they came to be. It’s an inside joke containing polar bears and cutesy nicknames. The strength of this band is in their quirky style. The Littlefield stage was in the back in a separate room from the front bar. For the most part it is standing room except for two tables and a few chairs along the wall. The room was pitch black and illuminated by the stage lights. Either the equipment at Littlefield is limited or there was no rehearsal for stage lighting. One of the guitarists played the whole time in the dark. The instruments were clear but the microphones made all of the vocals sound muffled. Though not perfect, the night was memorable and an important one. Here's a cheer to firsts in NYC! I am not embarrassed to say that, up until a few years ago, my only association with Texas was reciting song lyrics I learned from Pee-wee's Big Adventure. On a recent trip, I was enlightened. I got to experience Houston, mostly on foot. A car was helpful, but since I was situated in the downtown area, I took advantage of the METRORail. At just $1.25/ride, it will pretty much drop you right in front of all the local attractions. Hello Houston! Houston is home to Rice University and the Rice University Art Gallery. The Rice University Art Gallery is the only University gallery in the United States devoted to installation. Across the street is Hermann Park. It is extremely clean. It has plenty of jogging paths, space to walk your dog, and picnic tables galore. In the center is a structure similar to the Washington Monument and at the end is a beautiful arch honoring Sam Houston. The area is popular amongst families and taking pictures for Quinceaneras. 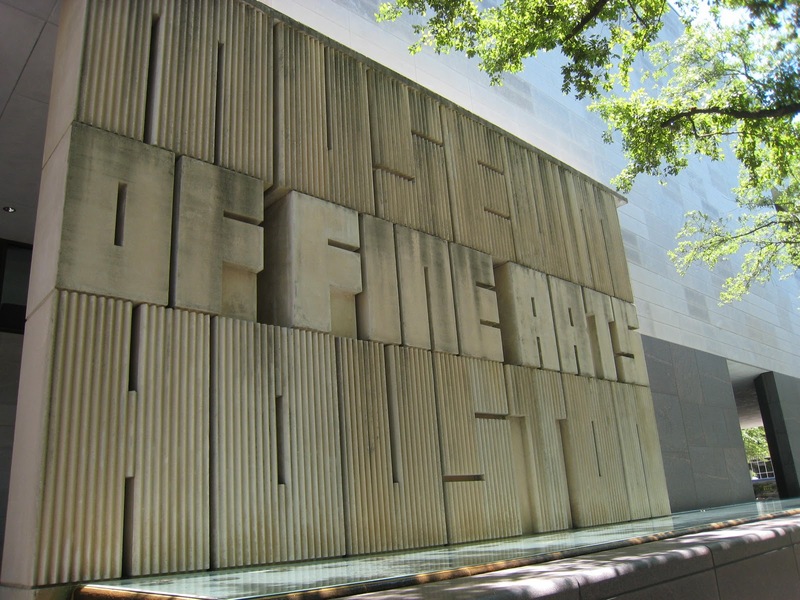 The Houston Museum District boasts 18 acclaimed museums. I only had time for one, The Museum of Fine Arts, but the Houston Museum of Natural Science came highly recommended as well. For shopping, Rice Village has a nice mix of big chains such as the Gap and Ann Taylor while mixed in with funky boutiques like Mint Clothing & Accessories and Wish. All the walking and heat will get you hungry. The Breakfast Klub has chicken and waffles. Niko Niko serves classic Greek Fare. Armandos is a newly renovated Mexican bistro. For an upscale dining experience complete with waterfalls and a balcony view Trevisio Restaurant is at the top of the Texas Medical Center. There is so much more to Texas than just an 80's movie. Next stop... Austin. Did someone say park? While the snow continued to fall and sun filled days at Sheep Meadow in Central Park seemed so far away, New Yorkers took advantage of a little pop up park at OpenHouse Gallery in Nolita. American Foliage transformed the space into a Summer wonderland complete with a giant tree, leaves, and a votive lit pond. The result was a little like being on a movie set. It made sense. American Foliage provides props and designs for television, motion pictures and special events. Park Here was a great success and at times got very crowded. Those who arrived early were rewarded with picnic tables, benches, Fatboy beanbags, and space to claim as their own. Everyone came prepared with board games, knitting needles, cards, take out from Balthazar, and my personal favorite a makeshift picnic consisting of a blanket, salad in a bag, canned peas, canned tuna, a can opener, and Two Buck Chuck. On-site vendors included Luke's Lobster and Intoxicating Creations. Let's just say that there was no shortage of food or fun at this park. Three rooms of indoor warmth made for a day of rest and relaxation. Rox and Judi w/ an i indulged in chitter chatter, cupcakes, cartwheels, a nap, people-watching, and photography ops.